Note: Incredibly, it’s been two years since my first blog post, reposted below. I’d like to believe that it stands up well and is still relevant even in the fast-moving currents of online learning. I’m drawn to writing a new chapter in the future; one that may drift more far-afield as my own interests dictate and life process guides me. For now, I’ll briefly look back on my journey and set a new path for myself– a path with heart. Imagine a six-story brownstone in the heart of New York City generously donated to the City University of New York. The brownstone is structurally sound and the donors have agreed to support the extensive renovation required to transform the space as the home of a new college. 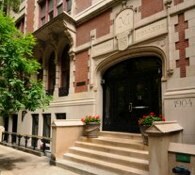 Such is a brief history of the Macaulay Honors College situated on a landmark site on 67th Street. The beautiful building required extensive renovation to become a state-of-the-art learning space. Would anyone argue with the claim that this building, and the learning taking place within its walls, represents a significant CUNY asset? Now, let’s image ten such learning spaces around New York City. Would they collectively represent a significant asset to our institution? Estimating from their website, the Honors College currently graduates between 600-700 students per year. Ten such colleges would graduate approximately 6-7000 students per annum. Given a concerted startup effort, I believe online programs throughout the CUNY system could easily accommodate these numbers, and moreover, represent an under-developed strategic asset for CUNY. However, many of these “virtual buildings” remain dormant, or un-renovated. The question of how a virtual space or program becomes an asset is not difficult to fathom when you consider that corporations are allowed to put on their books intangible assets like “good will” and “human capital.” Online programs within CUNY, albeit under-resourced and under-developed, represent a potential asset for the university on a par with buildings and campuses, faculty and intellectual capital. The issue is that this perspective is seldom if ever articulated or acknowledged. CUNY has a proud and unique mission of access to education, academic excellence and affordability. Every high school graduate in New York City is guaranteed a spot in at least a CUNY community college and, if qualified, a CUNY senior college. I believe online learning, implemented well, can expand access to learning, promote positive learning outcomes, and foster continued affordability from an institutional standpoint. In summary, online programs are entirely consistent with CUNY’s mission and vision. Online learning fosters a shift from instructor-based to student-centered learning environments which research indicates creates more significant learning experiences. This list is far from exhaustive and any brainstorming session could easily double the number of entries. As an institution, we need to look at the potential for online learning with new eyes. Are we sitting on a veritable gold mine of untapped potential and, if so, should we think of allocating sufficient resources to fully renovate and develop those virtual online spaces? This entry was posted in Envisioning Online, Online Trends, Strategic Planning for Online. Bookmark the permalink.